Ask a race driver why he or she does it, and you’ll get as many answers as you have drivers. Some race for the thrill of driving fast, some for the intrinsic or extrinsic rewards, some for the technical challenge, some for the spectacle and beauty of the sport, and some to win. Me? I race to outwit my competitors. It’s a mental game. A chess game at a hundred-plus miles per hour. I don’t care about being the fastest; I care about being in the lead at the end of the race. Having a car flirt with the edge of control while all the while positioning myself so that I either pass everyone else or they are unable to pass me…well, that’s why I do what I do. Brain researchers say that our subconscious mind can process four billion bits of information per second. I have no idea how they know that or how they counted all those bits in just one second! What I do know is that when my subconscious is driving the car, everything just happens. I’m on auto-pilot, like I’m just going along with the programming already in my head. All those bits of information are being processed in a hurry, in a way that means I don’t have to think. I just do. And then—and this is the best part—when I’m in the zone, my conscious mind observes every little detail of what I’m doing, making adjustments to my subconscious mental program. In the zone, my conscious mind is like a video camera that looks over my shoulder and watches my body do what comes naturally (although that naturalness has been programmed into me from years of training and experience). My conscious mind looks for ways to improve and learn while feeding sensory information to my subconscious, my inner programming. This programming then adapts and upgrades itself to the newest, improved version of the software, telling my hands, arms, legs, feet, and eyes to make the most subtle changes in where I look, how quickly I turn the steering wheel, the rate at which I lift my foot off the brake, and when I begin squeezing the gas pedal. Driving a car at the limit means driving at a speed where just a tiny bit more will cause it to spin or crash, and a little less means an even worse fate—being slower than the competition. Driving at the limit consistently means the car is oscillating between being over the limit and under the limit, but only just slightly so on either side. If I’m too comfortable, I’m not over the limit enough. If I’m too uncomfortable, I’m driving over the limit too much. There are moments—no, fractions of a second—where I’m over the limit and think that I may not be able to bring it back under control. But that feeling comes after the fact. In the moment, I don’t have time to think about it, so it’s only later as I’m driving down a straightaway when I can relax a little more, and the thought of what could have been might sneak into the back of my mind. I love that feeling! Being in the zone when racing a car is beautiful. Nothing in the past matters, nothing in the future matters. And neither the past nor future are anywhere near my mind—only the moment I’m currently in. Being in the zone when racing a car is magic. I can do no wrong, and I know exactly what’s going to happen. I can predict things that I shouldn’t be able to. I can see things that are unseeable. Being in the zone when racing a car is singular. I’m hyperaware, focused on one thing and yet everything. There are no distractions. I see and am aware of what I need to be, and nothing else. Being in the zone when racing a car is home. 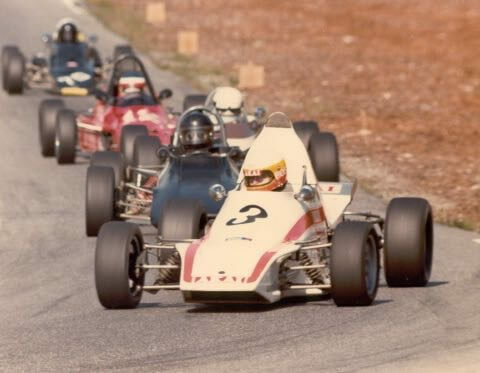 From that first time I experienced it, cocooned in the cockpit of that Formula Ford, the g-forces squishing my body in the turns of Willow Springs in the Mojave Desert’s sweltering heat, I knew that’s where I needed to be. I was to spend the next three decades going back there. My very-mobile home.